Sure it's easy to go pick from the slew of character cards at your local big box store, but why would you want to do that when you can just print these cuties from home! Save yourself the stress and limit the meltdowns...pour yourself a glass of wine, peel and stick some kisses! 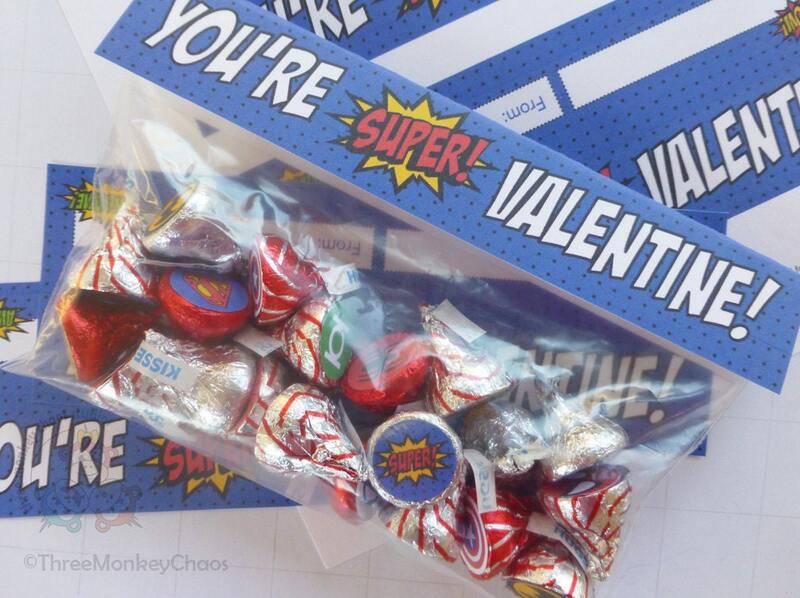 You will receive (3) 8.5" x 11" PDFs that include 3 Snack Bag Size treat bag toppers, (9) Small treat bag toppers, and 1 sheet of (70) 3/4" super hero stickers that fit perfectly on the bottom of kisses, rolos or your favorite treat. The small tags fit the 3" x 4" small jewelry or craft resealable bags found at your local craft store. Or just simply print for an easy classroom Valentines card! Cards print best on bright white store brand photo matte paper or white card stock. Stickers print best on an uncut sheet of sticker of label paper. Use a 3/4" circular cutter. I was disappointed that there was a typo on the instant download file. Directions for plane assembly were not easy to follow. I would not recommend. Printable Valentines | Paper Airplanes | Kids Valentines | Classroom Valentines Cards | Fold and Fly! I am sorry that you were unhappy with your printable airplanes even after I corrected "Valentines Day" to "Valentine's Day" and also created a custom design for you. I will also be sure revise the folding instructions for easier understanding. I'm realizing kids do not have that skill set since a majority of their time is spent on electronic devices. Thank you for your feedback.